Turn your back for just a moment and you can expect another dozen Irish-themed slots to appear out of nowhere. The good news being that with Wish Upon a Leprechaun, Blueprint Gaming delivered the goods in a big way. Far from yet another clone of hundreds of similar slots doing the rounds, Wish Upon a Leprechaun is bursting at the seams with unique features and bonus rounds! Wish Upon a Leprechaun is based on the Emerald Isle, which is of course, not new to slots, but in this instance, it’s done up with a certain amount of style and sophistication. The action takes place in front of a Leprechaun’s cottage! Infectious Wilds feature – overlay wilds that appear in any positions on the reels and lock in place for one free respin. They Think It’s All Clover feature – the addition of random stacked wilds across the five reels and one of the most impressive puns of the year! Colossal Spin feature – winning potential is boosted with a huge symbol that can cover three entire reels consecutively. Spin Streak feature – after hitting a winning combination, the winning symbols become sticky for a free respin. If the subsequent spin generates a win, the cycle continues until no new winning symbols land. Bonus Boost feature – a bunch of additional bonus symbols are added to the reels, boosting your chances of accessing one of the primary bonus features. Chests O’ Plenty feature – essentially a replication of the classic Deal Or No Deal format, you’ll pick a chest, be made an offer which you can accept or decline and continue going until you either lose or accept an offer. Nags T’ Riches feature – collect multipliers as you travel around the racecourse, which continues until you collect five Big Money symbols or land on a collect symbol. 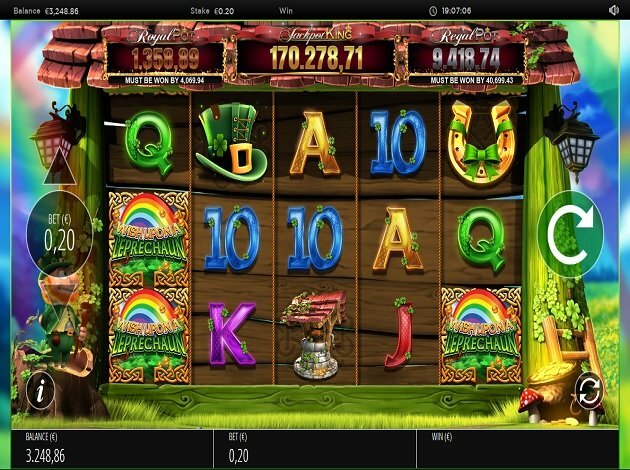 End O’ The Rainbow Free Spins feature – unlimited free spins to play with, along with the addition of a special scatter symbol. Not to mention, up to four additional wilds to maximise your winning potential. Clovers Rollover Free Spins feature – play with 10 free spins, with the added bonus of a wild overlay which could cover a massive 3x3 area. That’s up to nine wilds on the central three reels for the duration of your free spins. Big Money Bonus feature – you’ll need five Big Money symbols courtesy of the Nags T’ Riches feature to access this bonus round, where enormous multipliers are on offer if your jockey comes in ahead of the pack. Wish Upon a Leprechaun really isn’t messing about when it comes to cash prizes up for grabs. During normal play, the Wish Upon a Leprechaun logo and the wild symbol offer the top prizes – 500 coins for five in a row. The leprechaun’s hat has a top prize of 300 coins, followed by the lucky horseshoe and the Ace that are worth up to 200 coins each. Even the lesser playing card values pay generous prizes – anything from 50 to 100 coins for a winning combination. Of course, the biggest prizes of all are those three elusive progressive jackpots, as part of the Jackpot King Network. Keep your eyes peeled for five Jackpot King logos in a row and you could be hitting the big time in no time! As touched upon, Wish Upon a Leprechaun is presented in a much more polished and professional way than your average Irish-themed slot. You’ll find it hard not to dance a jig to the infectious soundtrack, which is accompanied by amusing sound effects. As you’d expect from Blueprint Gaming, the animations are first-rate from top to bottom. The happy leprechaun stands next to the reels and a bright rainbow can be seen in the background. Overall, this artwork is so cheerful and happy that it’s guaranteed to make you smile!